To celebrate Graeme Base's birthday this year I will be awarding one lucky reader of Happy Birthday Author a copy of Animalia for iPad or iPhone. I decided to download the game for my children after watching the YouTube video below. In the video, Base describes the game and all of its options that bring the popular book to life. My son and daughter absolutely loved the game (my daughter became slightly obsessed!). Please fill out the form below the birthday post to enter to win. Good Luck! Congratulations Alison Stallcup for being selected as the winner of the Animalia App! Thanks to everyone that entered! Complex. Absorbing. Creative. Unique. These are words that come to mind when I think of books by Graeme Base. He is an author and illustrator that typically takes up to three years to complete a project. It often takes this long for him to get the detailed illustrations and well composed poetry just right. Additionally, many of his books are full of hidden images or puzzles. When you pick up a book by Graeme Base prepare for time to evaporate more quickly than when reading an average children's picture book. Graeme Base, a former commercial advertiser, claims to be one of the few authors to never receive a rejection letter. He published his first book, My Grandma Lived in Gooligulch , in 1983. This is a book about a grandmother that interacts with animals in a way that made her famous all over Australia. The book is full of wonderful illustrations and rhythmic verse that impressed publishers to commission the three year project that spawned the book Animalia . Animalia, the book that launched Base's career, is an alphabet book that is written in alliteration, repeating the same beginning consonant sound 3 or more times in close succession. My favorite line in the book is, "Ingenious Iguanas Improvising Intricate Impromptu on Impossibly Impractical Instruments". The combination of these words with the elaborate illustrations led this book to sell over 2 million copies worldwide. "Elaborate illustrations" may not begin to explain the number of items on each page that have the same beginning letter. I have read that there may be over 1,500 items to find throughout the book. While you are looking for all the items you can also try to find Graeme as a little boy. He has drawn himself into every single page much like the Where's Waldo books that were popular back in the late 80s. Many think that Graeme copied the Where's Waldo style, but it should be noted that Base published Animalia in 1986 and the first Where's Waldo book was published in 1987. April is National Poetry Month and many schools and libraries are already studying and celebrating poetry. When I started the research for this blog post I did not view Graeme Base as a poet, however, many of his book are written in verse. His writing has been described as "relentlessly rhyming verse." Graeme's favorite hobby is creating music. He feels his love of music makes writing verse much easier than prose. The poetry he writes may tell the story in his books like The Eleventh Hour and Enigma: A Magical Mystery, but these puzzle books offer so much more. Most of my time this week was consumed reading these two titles. The Eleventh Hour is a book about an elephant named Horace that puts together an extravagant eleventh birthday party for himself and ten of his friends on the eleventh of November. He prepares 11 games to be played before the group gets to eat the feast at eleven o'clock. After all the games are played the group is stunned to find out that the feast has disappeared. It is the reader's job to go back through the book to unlock codes to reveal the thief. In my opinion, as someone of normal intelligence, I found the clues and codes hard to find. If I was lucky enough to find a code, I had a hard time deciphering it. I spent hours on this book by myself. I was stumped and I had to look at the solution to find out the final answer. Even after reading the solution there were even more fun things to find inside each page of book. It was a fascinating yet frustrating experience. Enigma: A Magical Mystery was a much easier puzzle book and my daughter and I were able to work together. This is a story about young Bertie Badger and his grandfather, a retired magician. Bertie always looks forward to a magic show when he visits but one day his grandfather's rabbit, Enigma, had disappeared along with other magic tricks from various magicians in the village. We as readers must find all the magic tricks through the use of a code at the back of the book. Also, Enigma is hidden (just like young Graeme Base in Animalia) on every page. I believe that I love Graeme Base's books because of the hidden images. I love the challenge of trying to find little Graeme Base, Enigma, or find all the items that begin with the letter B. 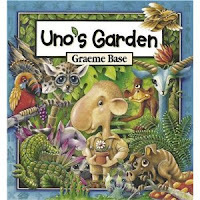 Two of my favorite books by Graeme Base also have hidden images, Uno's Garden and The Water Hole . Both of these books are great books for Earth Day which is celebrated on April 22. The Water Hole could be called a companion book to Animalia. Instead of an alphabet book, The Water Hole is a counting concept book with a little geography. The story begins with a rhino drinking from a large water hole. The pages are filled with Base-like drawings that are full of hidden animals that are fun to find. The water hole is a die-cut that slowly gets smaller throughout the book. Animals from all over the world are highlighted until the water hole dries up and the animals disappear. It does end positively because the rain eventually comes back and the animals return. Uno's Garden is about young man who moves into a beautiful area of the forest. He is surrounded by elegant plants and interesting creatures including the elusive Snortlepig (hidden feature of this book). More and more people follow Uno into the forest. The people build more buildings, and the buildings bring more people. The influx throws off the balance of nature. The plants and animals disappear until one day all that is left with Uno is his garden and the Snortlepig. It isn't long before Uno and the Snortlepig die and all at his left is the garden. It is Uno's children that slowly rebuild nature beginning with the garden. However this time, close attention is paid to keeping a balance between the impact humans have on nature. Eventually, all the animals and plants are restored except for the Snortlepig. But, there is hope. There were three other books that I read this week, The Discovery of Dragons (surprisingly humorous), Jungle Drums (another possible Earth Day story), and The Worst Band in the Universe (includes a CD of Graeme Base's music). However, I have already written more than I wanted too. Many readers have already probably clicked away from the blog. Those of you who are reading this paragraph, thank you for sticking with me. I truly love Graeme Base's books, my kids loved just looking at the pictures and finding the hidden images. He claims that he doesn't create books for any one age group. Alternatively, he writes and draws to fulfill the creative drive within himself. The bottom line is that kids and adults love his books and I hope you have fun this week. Note: I mentioned April is National Poetry Month. I did not read Jabberwocky by Lewis Carroll and illustrated by Graeme Base. However, this book may be another option for celebrating poetry. Click here to download this week's Library Checklist. 9. Music from Worst Band in the Universe - YouTube - W.Y.S.I.W.Y.G, 90L-YftS, Let's Go, Fade Away - for more check related videos. 12. Graeme's YouTube Channel "BASE FACTORY"